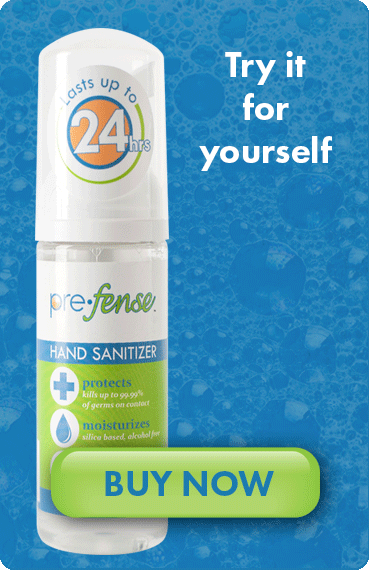 I rely on Prefense to keep me germ-free on a daily basis. I am an outreach counselor, and the homes that I visit are not always sanitary and I meet with my clients throughout the flu season, so I need the protection. For years I used an alcohol-based hand sanitizer because it was all I knew, but I hated the smell and I didn't like what it did to my hands. When I was introduced to Prefense, I was very excited and relieved. I can feel confident going out to my client's homes every day and I don't have to feel like I have to stop between sessions to wash my hands. Last year was my first Prefense year and I stayed healthy throughout the flu season (and that was without the flu shot). I have one in my car, one in my purse, and one in my home. Worry-free and germ-free...amazing. Prefense is a wonderful hand sanitizer. I have been using it daily for almost 2 years personally and professionally. I like that it is alcohol free and it is easily absorbed. I just wanted to take a few minutes to thank you personally for your samples of Prefense which you dropped off at my school. The kids and I love the product and I currently have the healthiest homeroom at our school with very few absences so far this year. I will continue to encourage our principal to purchase more of Prefense in the near future. Thanks again! I'm a kindergarten teacher and I use Prefense every day at work, I love it! With all the sneezing and coughing going on right now, I really feel protected.